As a fledgling fighter pilot in combat training, I was privileged to fly the Curtiss P-40 Warhawk. The Warhawk was a gigantic step up from the North American Texan/AT-6, which I had flown in advanced training at Tuskegee Army Air Field, Tuskegee, Alabama, as an Aviation Cadet. Once I soloed in the Warhawk, I knew I had "arrived". I was ready for bigger and better things. Lo and behold, along came the Jug! Weighing in at 14,000 lbs., stripped, it outweighed the Warhawk by 3700 lbs., stood 4 feet taller and was faster by more than 100 MPH! What a monstrous fighter! I was assigned to the Jug at Walterboro Army Air Base, Walterboro, South Carolina, where I took advanced combat training. I adapted very quickly to this giant with its "built like a brick (out)-house" fuselage; massive, seemingly impervious construction; ultra-wide landing gear; and its huge Pratt & Whitney radial engine, which could generate 2525 "horses", twice that of my erstwhile love, the beautiful, suave P-40. 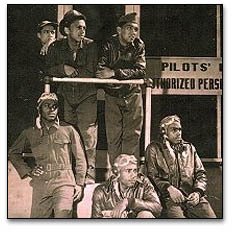 Bill Wheeler (far right) at the age of 20. That plane took off with so much power and torque, I had to practically stand on the rudder to hold it straight. However, once in the air, it was smooth and responsive and provided so much stability and confidence that I felt invincible and challenged every plane I saw near me. I especially sought out the Vought-Corsairs flown by the marines stationed at nearby Parris Island. They could out-turn me -- but I could outmaneuver THEM. That's where I really learned combat tactics! Another squadron buddy had feelings similar to mine; however, he had a grandiose plan involving the Jug. He let it be known that he was going to try to reach "compressibility" in the Jug. (He had probably completed the maneuver successfully in the P-40.) Compressibility, as he described it, was accomplished by taking the aircraft up to a "safe height", 25-30,000 feet or so, then plunging into a vertical dive, at full throttle, until the plane red-lined at maximum speed; at that speed, the airplane could be brought out of this high-speed, high pressure plunge ONLY by pushing the stick FORWARD (not back) -in theory, a reversal of controls, he said. 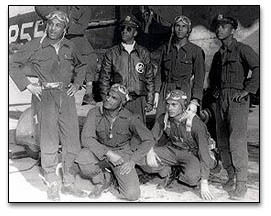 Bill Wheeler (2nd from left, top) with fellow Tuskegee Airmen. Two days later, as I lay on my bunk listening to the King Cole Trio, my reverie was rudely interrupted by a loud, eerie, whining drone. Suddenly, a loud thud punctuated the drone, followed by stark silence. I knew one of our planes had gone down. I prayed that the pilot had bailed out. I ran outside and climbed into my Jeep, along with a couple of fellow pilots. We could see the tell-tale plume of black smoke rising swiftly into the beautiful, sun-drenched sky. The beautiful sky gave us hope that our friend might be alright. As I plunged through the woods and rough terrain, it was impossible to see if a parachute was floating down. We finally reached a clearing in a clearing made by the Jug. Fallen trees, tree limbs, and loose dirt surrounded a crater in the earth twenty-odd feet deep and fifty-odd feet across. The plane had dived into the ground nose first and vertically! We searched the sky for the familiar parachute canopy - but it was nowhere to be seen. When we looked into the crater we saw large sections of the jug still intact; however, we were shocked to find small body parts, and flying gear imprinted with the name of our experimental buddy. No doubt, he had tried for compressibility -- but miscalculated the ferocity of a dive in the heavy Jug, with its huge radial engine. One of the guys remarked, "He miscalculated by about 10,000 feet!" We all were amazed at the structural integrity of the Jug's fuselage. Many of the substructures were damaged and bent, but they remained intact. This accident helped to further reassure us of the strength and durability of the Jug, which our group, the 332nd Fighter Group, was flying in combat, at that time. We all agreed that it was a superb fighting machine. However, I flew the P-5 I Mustang - another great fighter -- in combat. Post Script: After the war ended, I did not return to my home in Detroit, Michigan. I came to New York, instead. In the '70s, I worked as a Methods and Procedures Analyst at Fairchild-Republic in Farmingdale (which had manufactured the Jug). I was heavily involved with manufacturing procedures, work and parts flow, security and inventory control related to the A- IO Warthog and the Space Shuttle. It's a VERY small world.